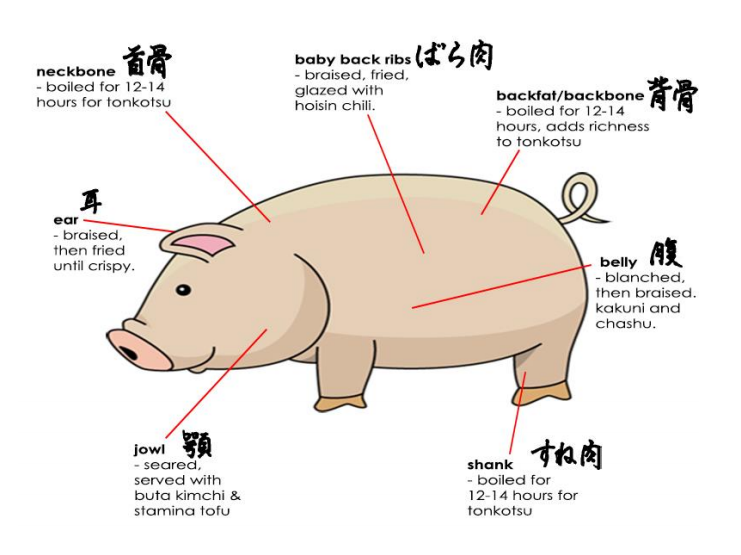 One glance through the pages of the Momosan Ramen & Sake menu and you’ll notice we are not shy about our use of different portions of a pig. Through the provided picture on our dinner menu, we show how different cuts such as belly, feet, shank, neck, back, ear, ribs, and jowl are used in different dishes. At Momosan Ramen & Sake, select cuts are not from the standard “ordinary” breed, but rather are from the rare breed known as Berkshire. Berkshire pork, sometimes referred to as the “black pig”, dates back to the 1600’s in the Berkshire county of the United Kingdom. Soon after the discovery of the rare breed, a litter was gifted to the Japanese region of Okinawa, where the people were extremely impressed with the quality of the meat and sent some even further north to Kyushu. To this day, Kyushu is the home of the popular Kagoshima Kurobuta brand of Berkshire pork. Momosan tonkotsu ramen has a distinct rich flavor and unctuous quality, which is strengthened through the use of Berkshire back, neck and split bones. The Berkshire bones are boiled with additional pork fat and chicken bones for 12-14 hours, resulting in the slightly creamy and wonderfully rich soup. Buta kimchi and stamina tofu are taken to the next level with the addition of seared Berkshire pork jowl. The marbled cut adds a creamy, tender pork element to the fermented dishes. Kurobuta sausage (sausage made from different cuts of Berkshire pork) is seared and served on an iron skillet, then steamed with sake tableside. Berkshire pork is best known for its depth of flavor, marbling, tenderness and juicy qualities. Through the use of this special breed, Chef Morimoto is able to elevate dishes from delicious to truly special. For more info, and to stay up to date on Momosan Ramen & Sake news, please sign up for our mailing list at the bottom of the home page!